We spoke a little about this on the 26th podcast and I wanted to post some of the notes we had from the podcast. Not too much to add really other than we’re excited but here are the details of the Xbox only releases for the Holiday season as of today. Here goes nothing…. On 9/22 Halo 3: ODST will be released it is a new, stand-alone expansion to the Halo saga that lets players experience the events leading up to the epic story told in Halo 3 through the eyes of an entirely new character the ODST (Orbital Drop Shock Trooper), as they search for clues leading to the whereabouts of their scattered squad and the motivations behind the Covenant’s invasion of New Mombasa. 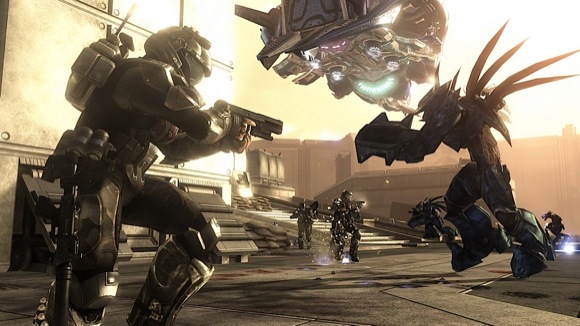 The game adds a new dimension to an all-encompassing universe that gamers around the world have known and loved since the release of the first Halo game in late 2001. Halo 3: ODST allows players to explore dangerous new ground, search the dark, abandoned streets of New Mombasa for clues, and fight back against the Covenant invasion from multiple perspectives. Dropping in as “the rookie,” a new member of an elite squad of Orbital Drop Shock Troopers (ODST) sent into New Mombasa on a classified recon mission, you’ll be armed with specialized weaponry and upgraded technology, including silenced weapons and a VISR enhanced vision mode. Separated from your squad, you’ll have to scour the city for clues in order to learn what happened to Buck, Dare, Dutch, Mickey, and Romeo. As you collect new clues, you’ll experience the story from their perspectives, fighting through the occupied city hours earlier. Whether it’s an exotic sports car like the new Audi R8 V10, a classic American muscle car like the Ford GT or a hot Asian import like the Nissan 370Z, everyone has a dream car. Live the most realistic racing experience ever as you take the wheel of more than 400 of the most-beloved cars on over 100 renowned real-world tracks and exotic road courses from around the globe. With breathtaking high-definition graphics and the most advanced vehicle performance modeling in a video game, “Forza Motorsport 3” includes a host of driving assists and adjustable skill levels to make the game a gripping pick-up-and-play experience for audiences of all ages and skill levels. Your escape into the world of car culture in “Forza Motorsport 3” doesn’t stop at the track. “Forza Motorsport 3” further fuels the imaginations of its already thriving community of painters, tuners and photographers with improved customization tools and brand-new ways to share creations with the world via Xbox LIVE. * Xbox LIVE makes your journey into the “Forza Motorsport” community and the world of user-generated content easy and fun. A love of cars lives in all of us. “Forza Motorsport 3” is the automotive playground we’ve all been waiting for. New game modes such as single-player season mode which puts you through a completely personalized racing calendar includes 200+ different events, including Circuit, Oval, Drag, Drift and Timed Events. Something to match every car lover’s dream including more than 400 fully customizable and tunable cars from over 50 of the world¿s leading manufacturers and 100+ international tracks. Look and feel of a modern racing game built from the ground up using with the most advanced physics models, artificial intelligence and damage calculations. Gameplay assists including auto-braking, gameplay rewind and auto-tuning that cater to how each individual drives and evolves with you over time as your skills increase. In-game elements such as Livery Editor, Auction House and Deep Tuning Garage that along with content via Xbox LIVE, allow players to express their car passion through user-generated content. Like Left 4 Dead, the sequel will involve the aftermath of an apocalyptic pandemic that created a number of zombie-like human mutants, forcing the few survivors to fight their way through the hordes to extraction points, using safehouses along the way to rest and recover. Left 4 Dead 2 will be set in the Southern United States, starting in Savannah, Georgia and ending up in New Orleans, Louisiana. Four new survivors will be introduced, with their backstory provided in a similar way to the original through dialogue in the game. The survivors include Coach, a high-school football coach; Rochelle, a news reporter for a local television station; Ellis, a mechanic; and Nick, a gambler and conman. Grand Theft Auto IV‘s The Ballad of Gay Tony will sashay into stores on October 29th as part of the Episodes from Liberty City retail disc. While hog ridin’ formed the draw of GTA IV‘s most recent DLC episode, The Lost and Damned, it appears that the sparkly nightlife and parachuting out of helicopters is what you’ll find described with enthusiasm on the back of the box. 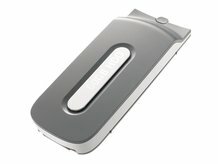 Rumor, Xbox360 getting 1 terabyte hard drive? Whoowee, I hope so, and for the love of gaming, please be affordable! Techradar.com has an article up that says an analyst is predicting the release of the drive when Project Natal ships. Though I hope it were sooner, it only makes sense now that Microsoft will soon be offering full 360 games to buy straight off the Xbox Live Marketplace. Add to that, 1080p video rentals as well….not only is that old 20GB drive rendered useless, but the 60GB as well…and the 120GB will only fill up fast. I’ve been bellyaching about what Microsoft does as far as hard drive prices for a long time now….I mean, c’mon, 150$ for a 120GB drive, when I just bought a 1 terabyte external drive for my pc for less than 100bux! Let’s hope for some good news soon. 1 Terabyte? I can haz it? June 26, 2009 Posted by richieraw | Normal Stuffs	| hard drive, project natal, Xbox Live, xbox live marketplace, XBOX360 | Comments Off on Rumor, Xbox360 getting 1 terabyte hard drive? Everyone knows about the announcement at E3 was Project Natal, that spread almost faster than the Keyboard Cat MeME. There is finally a picture up of that. And it looks like Hal from Space Odyssey but with 3 eyes. Hello Dave. 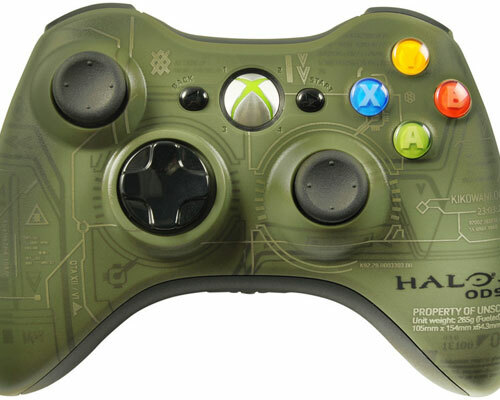 I know rich posted this jawn but I wanted to put up another picture of the Halo ODST wireless Controller. Boom. Will you look at that. Coming this fall, the 2nd piece of exclusive(timed?) xbox360 content for GTAIV. In this episode you fill the shoes of Luis Lopez, another secondary character in the GTAIV universe, and another guy tied to the big diamond heist in the main game. The other guy being Johnny Klebitz of “The Lost And Damned” fame. I’m sure you’ll get to do all the cool gangster stuff that we’re accustomed to in a GTA game, the main thing being that you work for Anthony “Gay Tony” Prince, hence the title. 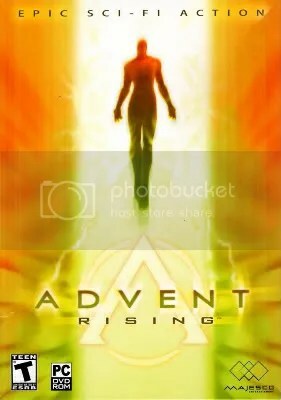 Here’s a quick description from the kotaku post, “According to the official announcement, “players will struggle with the competing loyalties of family and friends, and with the uncertainty about who is real and who is fake in a world in which everyone has a price.”….yup, sounds like GTA, can’t wait to play this. Man, I steamrolled through this DLC. For better or worse. Here goes nothing. 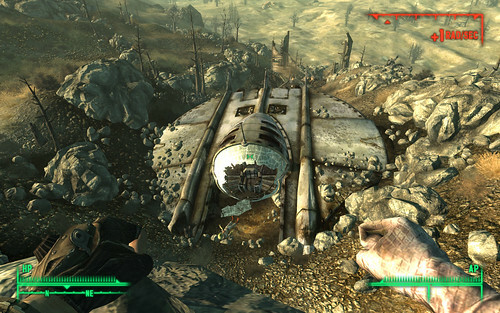 Good: You cant really mess up fallout 3, at least for us so more of it is always nice to have. It’s a interesting take for an add-on and works well in the context of the game. The change of pace from dark to light land textures were needed. There is a good amount of “mountain” country which to me didn’t exist in fallout 3. It all felt flat apart from boulders. DC is not really known for that I guess. The addition of the Gauss Rifle is awesome, the weapon just flat out destroy’s things. It has a knockback effect that is so clutch when fighting the new enemies in game. Bad: Not enough Quests, just the main chain and one side quest. Or did I miss it? I also thought there were not enough enemies around to get XP from. You don’t take your weapons in, this is a simulation, but it was hard to let go of all the awesome Power Armor I had, weapons and aid. You couldn’t do it any other way but, still, it stung a lil’. Ugly: This should not be 10$. It should be 5$. We discuss this on the podcast. How about you gimmie some of that power armor for my cataracts? 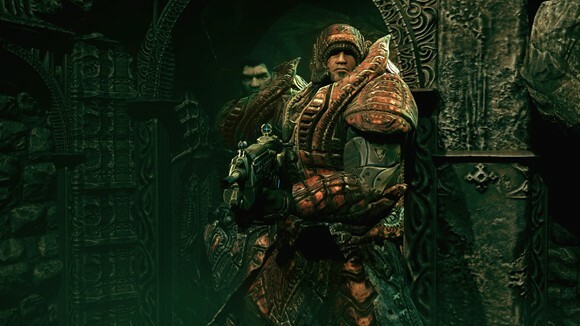 Just seen on joystiq that there’s a Gears of War 2 map expansion disc(I’m assuming the disc part) coming out. *Edit*-Got too excited, sounds like there’s a disc and it’ll be on Xbox Live for 20bux on July 28th. Now I normally don’t care about these things cuz I rarely do the online multiplayer thing anymore, but this is what caught my eye, a deleted campaign chapter called “Road to Ruin.” The J-man and I have expressed our love for the Gears series many times on the cast, so I’m stoked to have more campaign love…..is that weird?…WHO CARES?!? GIMME MORE GEARS!! 🙂 Check out Marcus and Dom pimpin Theron outfits!